Reduce your internal Agile PLM support costs while maintaining or improving system performance and end user satisfaction. 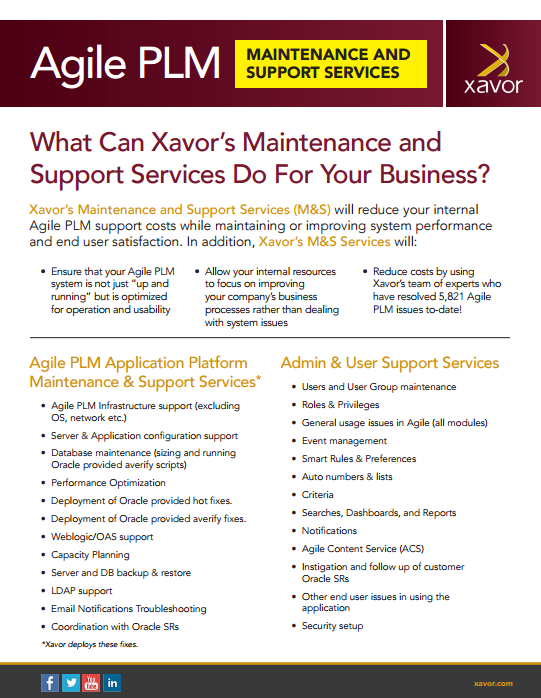 Xavor’s Maintenance and Support Services (M&S) will reduce your internal Agile PLM support costs while maintaining or improving system performance and end user satisfaction. Reduce costs by using Xavor’s team of experts who have resolved 5,821 Agile PLM issues to-date! Deployment of Oracle provided hot fixes. Deployment of Oracle provided averify fixes.